Bollywood superstar Sridevi, one of the Indian film industry’s most popular actresses, drowned after passing out in her hotel bathtub in Dubai, police said Monday. “Following the completion of post-mortem analysis, #DubaiPolice today stated that the death of Indian actress #Sridevi occurred due to drowning in her hotel apartment’s bathtub following loss of consciousness,” Dubai police tweeted. Police added that the case had been transferred to Dubai’s public prosecution office. Bollywood greats and Indian political elites flooded social media with tributes to the actress whose work spanned five decades and included some of the country’s most beloved films. Indian Prime Minister Narendra Modi was among the many who expressed shock at Sridevi’s death, with a tweet early Sunday extending his condolences to her family. Sridevi took a break from the limelight to raise two children with her husband, producer Boney Kapoor, before returning to star in the 1997 film “Judaai.” In the film, she plays an ambitious housewife who inadvertently marries a man who can’t afford the lavish life she aspires to lead. 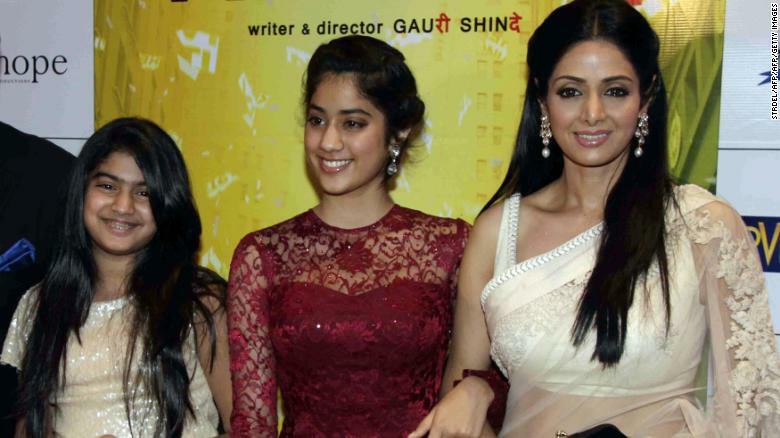 “Judaai” was a box office hit, but it was Sridevi’s performance in Gauri Shinde’s 2012 hit, “English Vinglish,” that solidified her comeback and confirmed her as one of Bollywood’s most treasured and enduring talents. 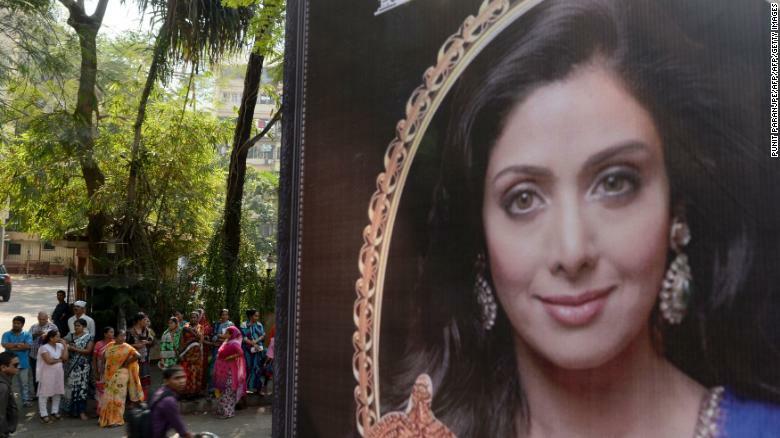 A picture of Bollywood actress Sridevi Kapoor is seen put up outside her residence in Mumbai on February 26, 2018, following her death. Sridevi took the starring role of Shashi, an Indian housewife who only speaks Hindi but is thrust onto the streets of New York to help arrange her niece’s wedding. After a series of humiliations, Shashi decides she needs to learn English and enrolls in a four-week crash course. “The way the character has been crafted by Shinde, and interpreted by Sridevi, is gloriously feminine, and uniquely Indian,” a review in the Hollywood Reporter said at the time. “Sridevi is one of the last great heroines of Hindi cinema who could hold her own against any hero,” said Rachel Dwyer, Professor of Indian Cultures and Cinema at the SOAS University of London. Indian Bollywood actors Akshaye Khanna (L) and Sridevi attend a promotional event for the film “Mom in Mumbai” on June 20, 2017. Sridevi’s credits span Tamil, Telugu, Malayalam and Kannada language films. She had broad appeal and was lauded for her captivating screen presence and versatility, even though she was quiet and reserved off-screen. Some of the country’s most prominent stars took to Twitter to express shock at her death. I am at a loss for words & jolted as if struck by lightening at this late hour of the night to learn about the shocking & tragic news & untimely demise of #Sridevi ji. Heartbroken. She was India’s sweetheart, an incredible artiste & a beautiful human being. Gone too soon. RIP. India’s President Ram Nath Kovind and Congress leader Rahul Gandhi offered their condolences. Sridevi’s impact was felt far beyond India, with London Mayor Sadiq Khan also paying tribute to the actress, whom he met last December. CNN’s Hilary Whiteman, Manveena Suri and Sugam Pokharel contributed to this report.